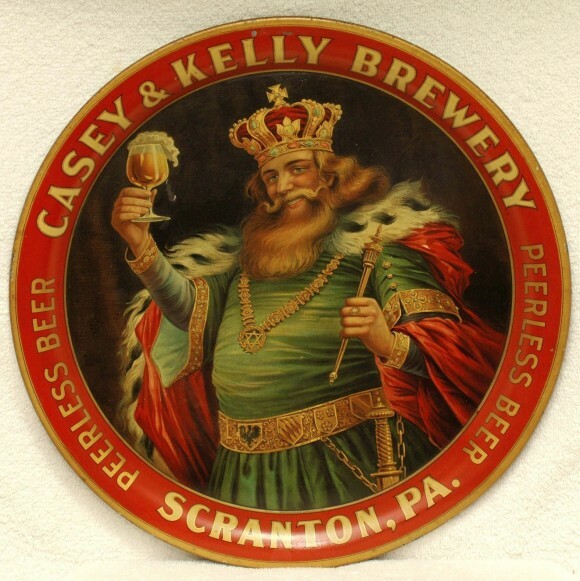 Serving Tray for Casey & Kelly Brewery Peerless Beer out of Scranton, PA with the central figure being a king holding up a glass of the company’s lager. The value of this tray varies significantly with condition so if you send a picture we can give you a good idea of how much your tray is worth. This is a pre-prohibition tray that is a 13″ round made for the Casey & Kelly Brewery by Haeusermann Lithography from Chicago. Note: We just purchased this tray from a contact off the website so thank you to Jonathan from Scranton for contacting us!